A concept album of cricket-themed music? Hmm. Sounds like a distinctly unpromising premise to me. 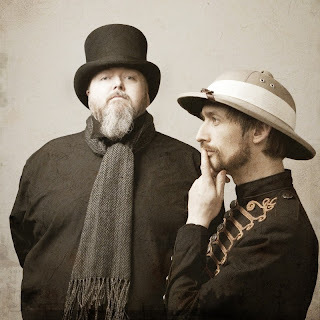 Well, in spite of that, in 2009 Neil Hannon from the Divine Comedy and Thomas Walsh from Pugwash produced exactly that... and against all the odds, it's a marvellous record. Even my wife likes it and can sing along to "Jiggery Pokery" about Shane Warne's famous delivery to Mike Gatting, and yet as far as I know she has never actually seen the ball in question and has approximately no interest in cricket beyond the fact that it fills her house with sweaty, drunk men once a year when my mates all come up to Nottingham to watch the Trent Bridge Test. It's a wonderful album, and "Jiggery Pokery" aside, contains some beautiful, pastoral odes to the beautiful game. Surely that's a one-off though, right? Wrong. Four years later and they've produced a second album of entirely cricket-themed music: "Sticky Wickets". It sounds a lot like ELO, but when was that ever a bad thing? I was actually offered an interview with Neil Hannon for Leftlion to help promote the new album and their gig in Nottingham to launch it. I wasn't interested in the interview (although I'll be sorry if no one else has done it), but was very grateful for the tip-off about the gig and bought tickets for myself and the biggest Neil Hannon fan in my life immediately. 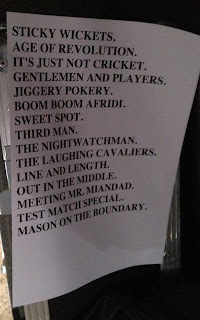 The gig was at the Nottingham Playhouse on the night before the start of the first Ashes Test of the 2013 summer at Trent Bridge... the weather is set fair and I've got tickets to every day of the test: what better way to kick things off than an evening of cricket-themed music? Compere for the evening is David Hepworth, and support is by Left With Pictures - who are okay, but whose best song by far is a Richard Thompson cover - and by a quick Q&A with TV Analyst, Simon Hughes. Hughes is on good form, and has fun at the expense of the likes of Ian Botham, Mick Jagger, Geoffrey Boycott and Derek Pringle. I actually physically bump into Pringle during the interval and he''s an ENORMOUS man. How did someone that big only bowl medium paced dibbly-dobblys? Hepworth has his own story about Mick Jagger: apparently he was sat near him at a Test in the Caribbean in the 1980s when England were being pounded by the West Indies. At the interval, England captain Mike Gatting approaches him and asks if he'd like to join the team for lunch. "No thanks, I've brought sandwiches" Beautiful. DLM then. Well, the first thing I notice is that Thomas Walsh is a VERY big man indeed. He's not as tall as Pringle, perhaps, but volume-wise I think he probably wins hands down. The second thing to notice is that the band have a beautiful, easy rapport with each other onstage.... they're clearly having fun, and we pretty quickly have fun too. As you'd probably expect from Neil Hannon, these songs are whip-smart: commentary on how the colonial masters are being usurped by the noveau-riche from the sub-continent, a juxtaposition of a fielding position with a film-noir ("Turd Man", insists Dubliner Walsh), a magnificent 80s pastiche ("Line and Length"), salutes to flamboyant Pakistani cricketers ("Boom Boom Afridi" and "Meeting Mr. Miandad") and several lovely salutes to a gentle game that, as David Hepworth notes, reveals the soul of its participants like no other. My favourite is "Mason on the Boundary" as it seems to sum up the village green origins of the game and it harks back - just as the game often does itself - to simpler times. It's a splendid evening and they're a properly good band. Two albums worth of cricket-themed music and they had the crowd eating from the palms of their hands. I also got a t-shirt compliment too when a man came rushing up to me at the end of the evening to ask where I had got my 1932 Bodyline Ashes Ramones-style t-shirt.... which is always nice. And now for the cricket..... The Ashes are resuming for the latest skirmishes in a rivalry dating back to 1882 and all for bragging rights and a tiny ceramic urn. It's the best contest in sport. See you at Trent Bridge! I remember hearing about this when it was in development...and then totally forgot about it...but I must have it! To the internet! ...or both of them, rather.